Star Wars Episode VII Cast Announced!!!!! Ok. I’m stupidly excited. It’s ridiculous after the massive disappointment of episode 1 after years of waiting and anticipation. And it’s all happening again. But….Han Solo. Luke Skywalker. And Princess frikkin Leia are back! So. J J and Disney. Please don’t mess it up! 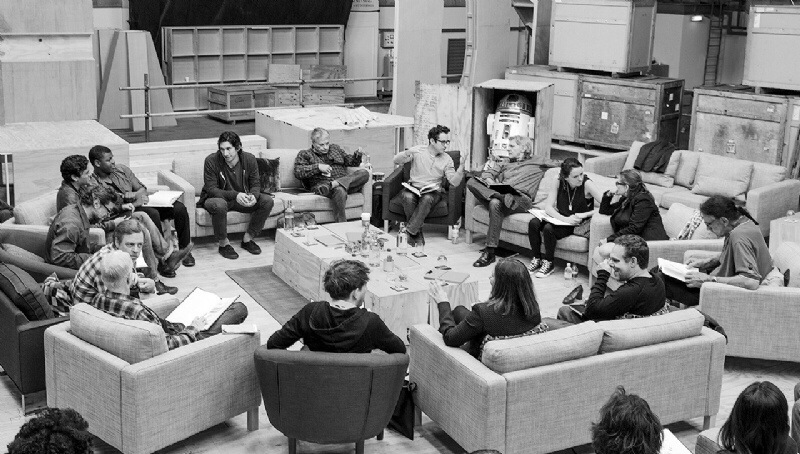 “The Star Wars team is thrilled to announce the cast of Star Wars: Episode VII. “Actors John Boyega, Daisy Ridley, Adam Driver, Oscar Isaac, Andy Serkis, Domhnall Gleeson and Max von Sydow will join the original stars of the saga, Harrison Ford, Carrie Fisher, Mark Hamill, Anthony Daniels, Peter Mayhew and Kenny Baker in the new film. Gollum’s in Star Wars! Awesome. I hope Andy is going to be a proper human character, because he would make an awesome nasty imperial pier of work. But there’s a strong likelihood he will be a CGI character. Max Von Sydow – awesome! There is so many possibilities in the Star Wars universe for his acting skills. Whoever he will play will most likely steal the show. Cannot find in the UK yet, should be in the £65-£75 bracket. As it’s name would suggest! Lots of zesty lemon! Lemon peel, juice, quite tart on the nose. Powdered sugar. Lemon drops. A deep sugar pit of sweet shops. A prominent chilli bite. Some orange citrus. Gentle oak in the background. Very crisp, lively and clean. The deeper the inhalation i get a mentholated twang. Sweet and sour. Lemony, sweet lemons, flat home made lemonade. A Little damp grass during the development. Mouth filling with flavour. Some gentl honey notes are creeping around in the background. More sweetness, a chewed wet grass sweetness accompanies the lemons, with some drying oak. A very pleasant balance and overly easy and very enjoyable experience. A tiny splash added. The nose has some added spicy bite now, with the lemons slightly dried down. The palate is still juicy and fresh, quite spritely and delectable with buckets of tangy fruit. The finish, still sweet, warming and very fulfilling. This is a fruit monster…is that a term, we have peat monster and sherry bomb…fruit nuke? It’s fruit fantastic anyway, very juicy and summery and a great starter to a Whisky night, palate cleansing and just plain damn tasty. Great thanks to Wemyss for providing the review sample. Stewed grapes. A reasonably dry sherry nose initially. Spicy, pepper, ginger, a little menthol. There’s some honey floating around, and a whiff of smoke. There’s a nuttiness to the nose also, reminds me of a walnut heavy nut mix. Sugar coated nuts. Some light toffee. Some mellow pepper and ginger. Very easy drinking. Quite spicy and nutty going down. Drying, toffee, some oak tannins. A touch of coconut. 2 drops added. The nose has a touch more smoke now and an added depth to the fruitiness, with some dry raisin added. The palate reflects this exhibiting a little more fruitiness, letting some of the nuts go wayside. It’s a touch more tannin-y mid development, with the finish, toffee and light tannins (stewed tea). Much improved with a small drop of water. I have to be honest, that’s what this blog is about, I preferred the 15 year old version (available here from MasterOfMalt). 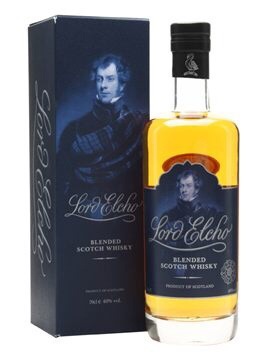 Saying that, this is a competent blended scotch, with a high percentage of malt content (40%). Initially sweet. Thick Honey, toffee, chocolate. This one turns more savoury with time in the glass. Now I get fragrant wood. Polish. A little glue. A touch of tobacco. On returning to the glass after a few minutes it’s more savoury and started to show its meaty side. A little bit of burnt ends and some beef jerky. Hmmmm. We have dusted pepper throughout. Fruit wise it’s quite backgrounded, but there are some rum and raisin if you dig. And a touch of desiccated coconut coming through now. A nicely complicated set of aromas. Who, there’s the fruit! Initially exceedingly fruity, berries, soaked sultanas, apple, some orange, turning chocolatey and deep with honey richness. Some chilli and ginger spices in the development, then progressing back to thick honey, chewy chocolate and sweet tooth heaven. The mouthfeel on this is very luscious and gives a nice satisfaction of melting chocolate. Yummmmmmm. Sweetness proceeds, honey, chocolate, caramel, a little drying oakiness, but ultimately full of those sugar sweet joys. A gentle splash added and sat for a while. The savoury and wood elements are fully in the front now. Still quite meaty, A dash of salt and a little charred wood. On the palate there is a little more of the savoury coming through, it’s actually slightly hotter on the palate than without water, with more spices hitting you sooner, holding it in the mouth though and the sweetness comes back through, salted chocolate honeycomb I think. The finish continues along the same theme, slightly salty, lots of chocolate based sweet shop stuff. A dash more water and we go into more floral areas on the nose, the palate now is more sugary and edging towards swizzles lollipops, and some chalky sweets, the chocolate notes having been slightly silenced, the finish warming and more malty than the fattening nature before. For me, some water not too much, but worth a long term experiment on this one with adding little water, wait, taste, water, wait, taste etc. lots of changes to explore. Interesting Mortlach this. Not a sherry bomb like some of the other Mortlach’s I have tried in the past, this one is subtle, the oak has had a nice complementing effect with the usual meaty spirit that comes from Mortlach. It’s reasonably complex, worth taking time over, and rewarding to one who likes their confectionary of the chocolate kind. The long awaited 2nd release of the sell out Loch Gorm of 2013. I reviewed the first release of Loch Gorm here if you care to look for reflection and expansion. I’m purposefully not rereading my original review to avoid influence. Pungent. Earthy. Moss. Dirty peat. And complex with it. Ashy. Bonfire embers. It’s like someone has bottled a smouldering camp fire in the woods. Chilli biting spices. Red berries. The fruitiness is very much background stuff amongst the underbrush, because the fire, while smouldering will rage with a little air blown on it. There’s a touch of vanilla sweetness there. Creamy. Some slight medicinal bandages/plasters in the background. Some road tar. Cigar box. Some struck match. All this burning and smokiness is surrounded for my by a layer of creaminess. Whilst most definitely intense on the nose it’s almost pulled back when you go in too deep. It’s a good thing, a very good thing because it shows some construction and complexity which you can delve deeply into. Time in the glass and some of the more sherried elements come about, still very much in the distance, but there is an element of burnt fruitcake coming through. And the berries, cherry now, cherry stone, some dry sultana are becoming more forward. Wow. What a nose. I could sniff at this for ages, it’s changing, evolving and always compulsive. Sweet sweet peat. Then a little dry campfire ash. More sweetness. Some light berries. Some creamy vanilla. Mouthcoating. Lightly oily. Some coal tar. A little bread yeast. More smoke and medicinal peat. Crisp and thoroughly satisfying. A final blast of smoke as I’m swallowing. I’ve inhaled the bonfire and now tasting it big time. The fruity berries are there in the finish, along with a massive smokey whiff. Sweet peat. A little drying earthiness. Sweet light burning sugar caramelised with a cherry on top. Just a small dash of water, I don’t actually think it needs it and don’t want to completely extinguish the fire. Ok, got a little distracted with a phone call so it sat for a good while with a drop of water. The fire…is very alive, lots of smoke billowing on the nose, pure bonfire intense. Dry fruits still in the background, but much searching through the smoke to get to it. The palate isn’t as sweet now initially, dryer smoke meets the arrival, through development some fruity elements come in, but the dry smoke, haystacks and some earthy grassiness is present now, still very crisp and clear. And still with some lovely oiliness. The finish is full of that smoky intensity, with some creamy oak spices and berry finale. For me this is an improvement over the first release of Loch Gorm. From memory I though release 1 had very little sherry influence, this release is limited on the sherry influences, but it does have a fruity presence. With water it has one of the more smoky experiences you can have from a Islay whisky. This really is a great dram, arguably more of an autumn/winter drink, I wouldn’t wait that long to get a bottle though because you know it’s going to sell out quickly, and deservedly so. I will be buying this one as a priority. 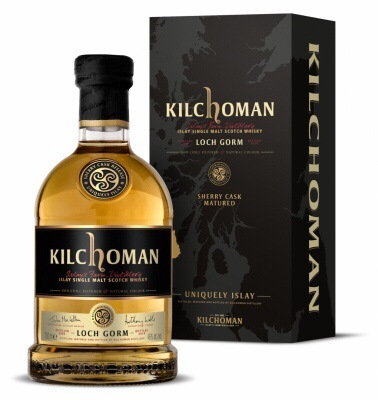 Great thanks to Kilchoman for providing the review sample. Nadurra in Gaelic means ‘natural’. And that is exactly what Nadurra is. Non chill filtered, cask strength, no colour. This promises to be a fantastic dram, so let’s find out. 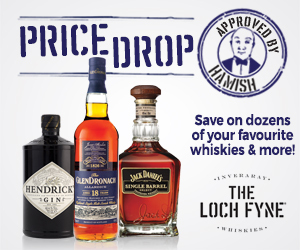 Expect a slight variation on batches, but from the reviews on whiskybase and the like your hard pressed to find a bad batch. Floral citrus. Sherbert. Sweet shops. Powdered sugar. Lemon juice and peel. Oranges. Jammy marmalade. Some light white pepper. Vanilla. Creamy. Light oak. The oak in this one is by no means dominant despite 16 years in the cask. Time in the glass brings more of the signature Glenlivet fruit salad forward, lots of apple, pear, citrus, a touch of pineapple. Lovely fruity nose. As per the nose, fruity. Bit of a alcohol nip, as expected. Sweet and sour. Followed by more fruit, drying fruit, not sweet. Some berry notes. Vanilla cream, apples, pears, complex jam, The oak is more noticeable on the palate with some drier and more bitter oak tannins coming through. Some spicy hit there with oak spices and pepper. The fruitiness goes into the finish, with varying spiciness followed by drying oak with a little stewed tea on the very end. With a little water we have even more citrus tang on the nose with a little added floral, and some dusty sugar. The palate is now mellow from the alcohol nip. There’s a little chalkiness to the mouthfeel now, the fruits are still juicy and intact, the spices lowered in intensity, the bitter mid-development is no longer there, it’s very stable throughout development and well balanced. The finish is sweeter, more powdered sugars and fruity tangs, and very very palatable, thirst quenching and inducing at the same time. A solid dram. Good session stuff, with some nice investigative complexities while at the same time can be taken for a steady enjoyable drinking experience. Good stuff! Thoroughly looking forward to trying the new Nadurra Oloroso when it becomes available later in the year. Source – My own bottle. And many more to come! 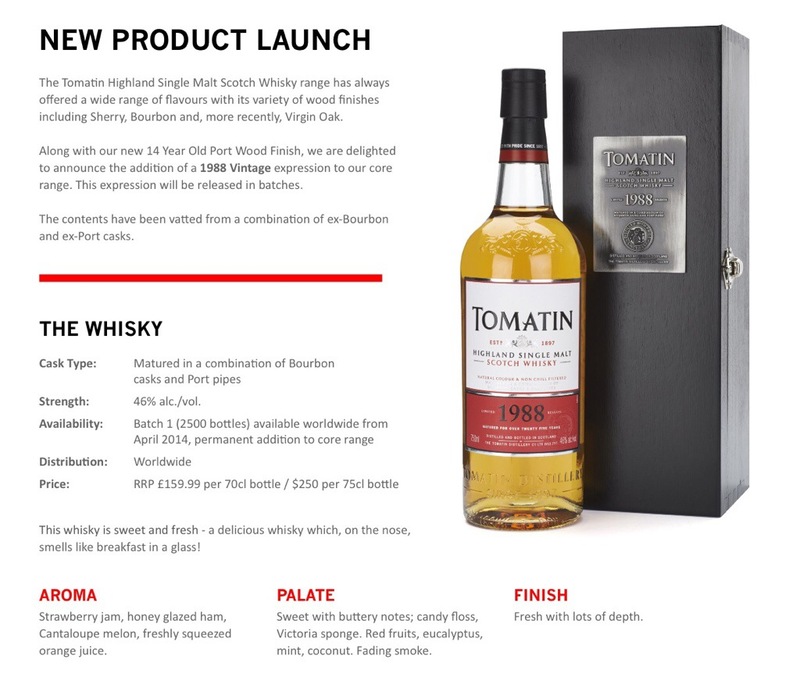 The Tomatin Distillery Co Ltd has announced a change to the line-up of its core range of single malts. A 14 year old Port Wood Finish and a batch release 1988 vintage are being introduced, while the 15 year old and 30 Year Old expressions will be removed. The 14 Year Old Port Wood Finish has spent around 13 years in the finest Bourbon oak barrels, with a further year in specially selected Portuguese port pipes which had previously held Tawny port for between 30 and 40 years. The result is an excellent dram which is soft and smooth with a port-influenced sweetness. 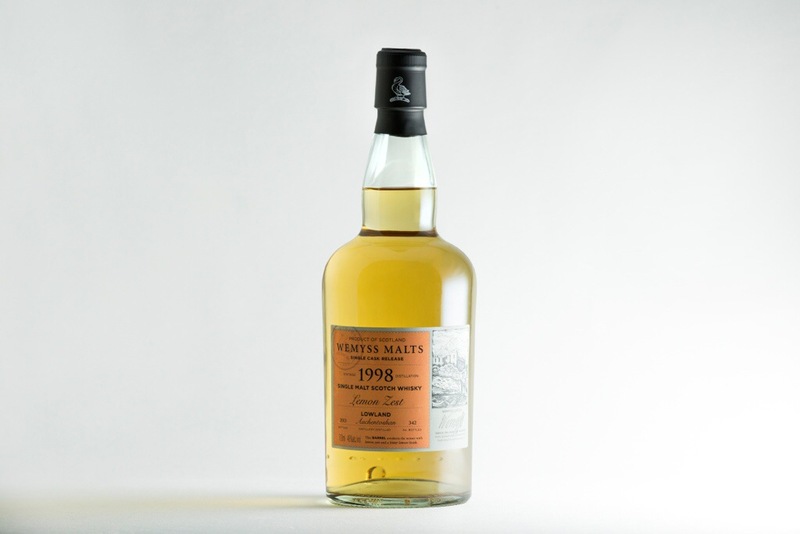 The 1988 vintage also takes on an element of port with its contents having been vatted from ex-bourbon and ex-port casks, resulting in a sweet yet surprisingly fresh dram. Presented in a wooden box with its own certificate, this expression will be released in batches, the first batch offering 2500 bottles. These two new expressions join the brand’s non-aged “Legacy” – matured in a combination of Bourbon and Virgin Oak casks – and the 12 and 18 Year Olds, both finished in Spanish Oloroso Sherry Casks. The 12 Year Old is now being sold at 43% alc./vol. 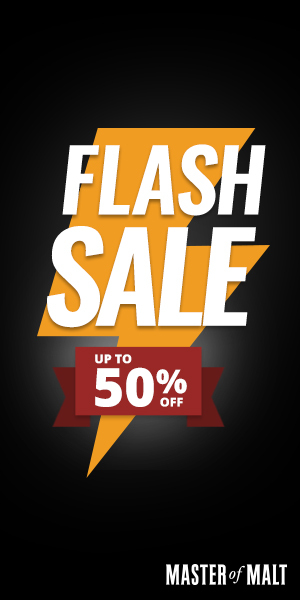 in all markets (increased from 40%). Jon’s thoughts – hats off for 43% on the 12yo, and very interested to try the new port influenced expressions. Gutted at the loss of the 30yo, going shopping right now! 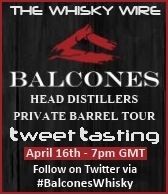 Tonight I consider myself supremely lucky to be able to be involved in this Balcones Distiller’s Selection Private Barrel Tour Tweet Tasting. 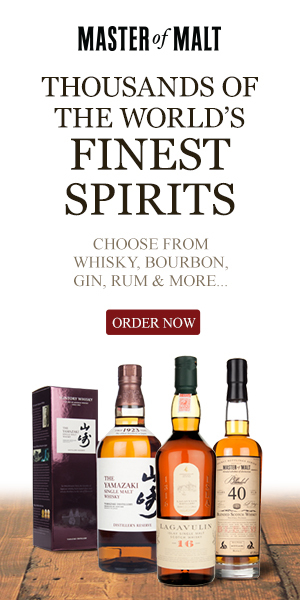 5 of some of the rarest young Whisky, from in my opinion the most interesting, and surprising distillery operating worldwide. Every time I visit a Balcones stand at a Whisky show I am always amazed by the flavour sensations I’m hit with. Tonight, I’m hoping once again to be surprised, enlightened and thoroughly entertained by Chip Tate and his amazing wares. Here we go. Sweet citrus fruit. Berries. Fruitcake. I would swear this a heavily sherried maturation, but it’s not at all. Thick with honey and Demerara sugar. Caramel. Wood shavings, like a carpenters workshop. Stewed bananas. With time, more citrus coming through, stewed apples, spicy vanilla, all sorts of everything. It’s so very complex. Very sweet, rum like. Powerful, but still easy drinking. Rich berry fruit, spicy vanilla custard, the mouthfeel is very viscous. Reminiscent of a spicy fruit crumble with thick home made custard. Chocolate notes are there in the development intermingling with oranges. Again, so much towards a very heavily sherried Whisky, but different and more complex! Surprisingly long, sweet, honey, toffee, chocolate, drying out with light oak, but all the dark berry fruit crumble with custard is very well retained. On the nose the diluted version is softer, but with take-your-breath-away spice. The palate is very much concentrated on the spices and oak now as opposed to the fruit. The finish is also about the spice. Adding some more water. Further diluted the palate is overwhelmed with the fruity elements, softer yes, mouthfeel less luxurious, but the fruit is exploding, very special indeed. Burnt fruitcake. Christmas pudding. Buckets of vanilla. Intense. Nasally invading. Oak leather, tobacco, clove. Buttery creaminess, dusting of cocoa. Treacle toffee, some light pleasant glue notes, aniseed. With time there is some fried orange notes, some donut mix just hitting hot fat, it’s really quite awesome. It’s a drowning nose, you could sniff this for hours and hate the smell of oxygen afterwards. Oh my god the mouthfeel! It’s the oiliest, thickest, viscous I think I’ve ever tried, and that hits you straight square in the gob. So much so I forgot to taste the first sip. Sweet liquorice, fruitcake, burnt oranges, complex spices, toffee, chocolate, fattening, Christmas pudding. Smooth considering the high ABV. Dammit it’s bloody good. Sweet vanilla, complex spices, aniseed, sweet liquorice. Concentrated dark fruit. The beast has been tamed a little. The nose is softer, more integrated and has an additional smoothness to it. Some added creaminess is evident, along with some buttered popcorn. The palate is sweeter, stick very thick in the mouth, with added juiciness to the fruit elements and such an easy drinker. The finish is refreshing, sweet, delectable. Should have bought one dammit. Stewed soft fruit. Banana, light oranges, fruit salad, light biscuit, fudge, cream caramel, Jamaican Ginger cake. With time in the glass it’s more buttery and creamy but always retaining the cake spice. Most excellent. Another quality mouthfeel. Fruit is juicy. 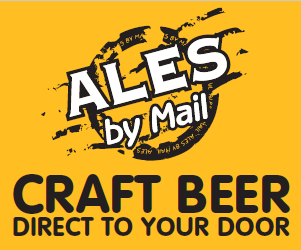 Dark fruits, fruit cake, warming, hugging, cream, vanilla, pepper, spicy and thick. Cherry stones. Some flat coca cola. Caramel sweetness to the extreme. Warming, and reliable. Definite feel good factor on this one. Sweet, cola, ginger, clove, pepper, fruitcake, vanilla, ending with sweet oak chips. On the nose we have more of a fruit stew, more floral, a deep and resonating nose now, the palate reflects the stew of fruit, cherries are now more mashed and flavoursome, and the finish is calming and seductive for another sip. Another massive nose to rival a lying Pinocchio. Creamy cereal, pepper, less intensive spice to the other drams tonight, more complimentary. Some smoke, but not an awful lot, more of a background char. Floral, crushed Parma violets, toffee, cream, some savoury, maple honey pork sausages overdone on a BBQ. Surprisingly smooth, very smooth. Sweet and savoury. The initial sweet blast is recovered by a savoury tang, Some BBQ, and a little smokiness, but the spicy vanilla retains it’s presence and is joined with some burnt fruit, then the burnt wood comes back and it is burnt, and flavoursome, with sweetness in the form of honey soaked into that flaming embers. Some plain chocolate, a little saltiness and maybe a chilli or two in that chocolate block. Off balanced with some sweet meaty notes. Quite a nice balance of these flavour profiles with none really overpowering the other. Rich, burning meat on a BBQ. Chocolate. Thinning out to spicy vanilla pods, some fried potato chips, drying sweet oak, and general all round pleasant feelings! The nose has a little more savoury to it, some extra floral and a little more brimstone bacon smoke going on. The palate is more concentrated on the sweet honey notes, with some smoke concentration mid-development, going into a intensely satisfying smokey juice of a finish. 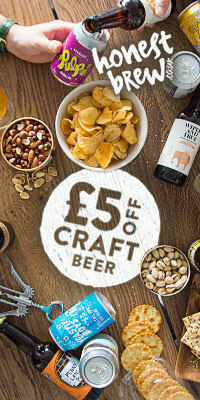 I’ve said this many time, it’s the first thing that hit me the first time I tried Brimstone, walker’s Smokey Bacon Crisps. Stunning! All savoury, dry, burning barbecue charred embers, burnt bacon meat (not the fat). A little hay. Chilli and pepper. This infused smoke is intriguing. There are touches of rubber on hot road, but the BBQ and smoke is fully embracing my senses. BBQ bacon with ample sugar/honey infusion. Quite a sweet peat note as well. Grass, hay, deeply burnt brown sugar, intense, salty, savoury, very different to anything tasted before. Some dark fruity notes, dates, figs, chewy, very chewy. Charred embers with some bacon meat still burning away. Some salt, sweetness from peat that isn’t peat. A little earthy tang. Quite special indeed. So very savoury. The nose now has a little more salted bacon and less char going on. Lots of dusty wood and spiciness. The palate is lighter, creamier, more corn, popcorn, corn husks, caramelled corn, buttered sweetcorn. Much corn! 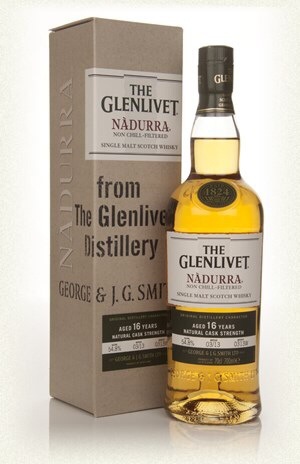 The finish is sweet and salty…popcorn… This is a very unique and from its production, unrepeatable dram. Honoured. 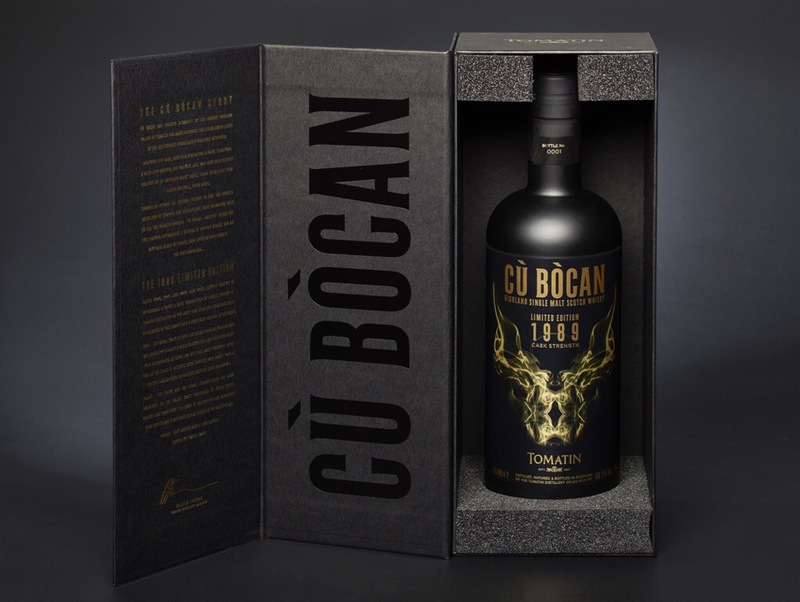 Now the beast has been unleashed in this sweet and smoky rare edition of Cù Bòcan. You can see my other blog entry with more detailed release information here. Light bonfire smoke. Lashings of vanilla. Clean engine oil. Pepper. Crisp apple. Pear. Light pineapple. Prominent oak. Some candle wax. Polish, and a little glue. Given a little rest this becomes very sweet. Sweet clean peat and creamy vanilla. There’s something savoury in the background. Salty even. Very sweet and smoky tasting. Fruity and sweet burnt earth, with a pineapple ring. Apples, pears, some orange, almost burnt orange. Considering the high ABV it’s not too destructive on the tastebuds and very easy going. Development continues to creaminess, buttery vanilla, some salt, and something savoury, almost meaty. The fruits in this palate all have a sensed of being dried out over bonfires. Very pleasant. Drying fruit notes, dried pineapple. Changing to sweet sweet vanilla custard and a little peat. Finale of drying oak. Little drop added. The diluted nose has a lighter floral element in the mix now, the fruits are also more intense and expansive. More prominent ripe pineapples and juicy apples, some orange pith and creamier vanilla custard. The smoke is extinguished a lot, but there is still a pleasant ember or two in the background. The diluted palate is far more fruitier now, very juicy in fact, with apple, pineapples and orange all there. Along with some complex spice involvement. Some sweet lemons, a little oak, very clean and tasty stuff. The diluted finish continues the theme, fruity, juicy and moreish. Well, well, well. This is a different dram, definitely a dram with two slightly varying characters. Undiluted lots of dry fruits and a touch of savoury, but with water a fresh fruity basket of wonders. Very intriguing. A lot of time can be spent with this dram deconstructing its character, complex and rewarding stuff. Something new – for an alternative point of view see my mate Steve’s review over at Somerset Whisky. 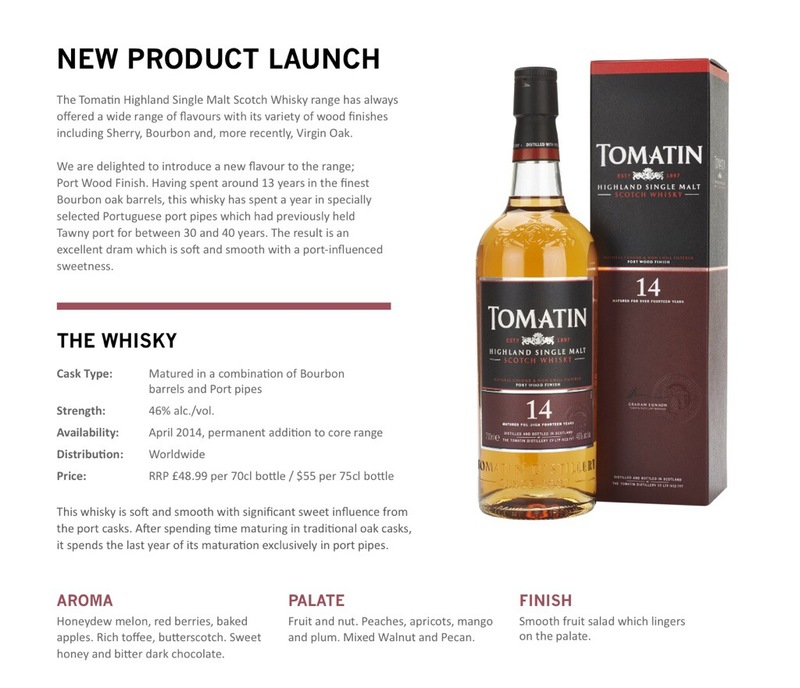 Great thanks to Tomatin for providing the review sample. 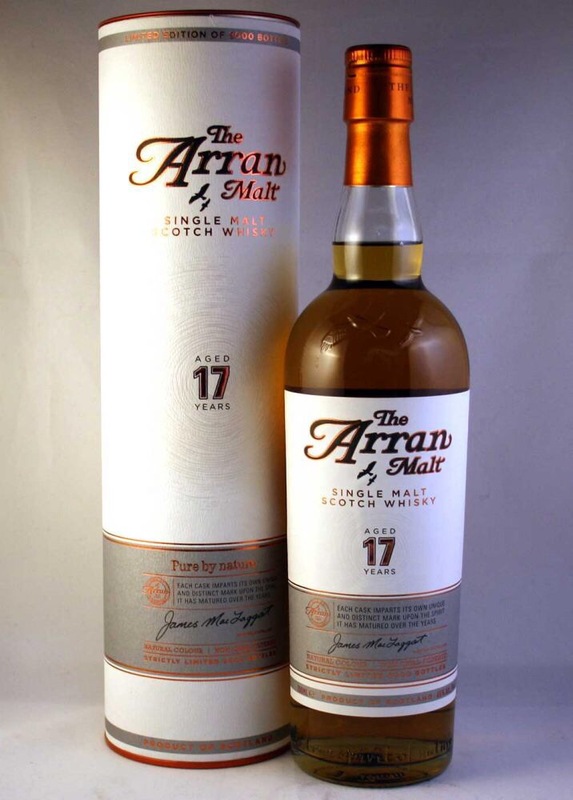 Here we have the 17 year old release of Arran. Next year the 18! Arran have been releasing these developing limited editions for the last couple of years to show the progressive maturation of their Whisky before their milestone 18 year old. I’ve been looking forward to trying this one, I bought the 16 after stellar reviews, but have yet to try it. I’m going to take the opportunity in the next few weeks to revisit my tweet tasting pack and the 16 year old. Also comparing an independent 17 year old bottling with this one. But that’s all to come. 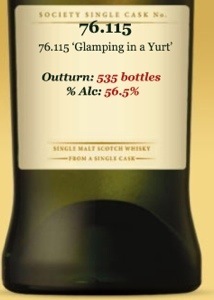 For now, here’s my notes on the official distillery bottling of the Isle of Arran 17. Fruity herb orchard. Alcohol soaked Raisins. Dry malty biscuits. Citrus. Lemon peel. Strong berry jam notes. Sweet cinnamon. Honey/caramel sweetness. Some wood glue and shavings. It changes a lot throughout nosing. More vanilla and sponge cake now. Loads going on. Sweet honey and vanilla. Crisp green fruits. Apples, pears, with lemon juice. Some pepper. Creamy custard. Light sherried fruits. A great fruity mix. The development goes into maltier areas, more buttery and relaxed. Then the jammier berry flavours return on the swallow. Lengthy jammy apples and pears, raisins and some fruitcake through to a pleasant drying oakiness. With the warmth still nicely settled in the throat area. Gently warming and relaxing. This is so very drinkable at 46% I almost don’t want to add water, but I’m going to. The diluted nose has more floral influences now, and more oak evident. The palate is more integrated now, lighter though in the mouthfeel. Still quite jammy, and full flavoured, but less intensive. The finish is drier sooner, still warming and very enjoyable, but I think I prefer this dram undiluted. This is a thoroughly tasty Whisky. I’m enjoying it a great deal. This will definitely become a purchase and I recommend it to those who like their whiskies fruity and full of flavour. Great thanks to Arran for providing me the review sample.